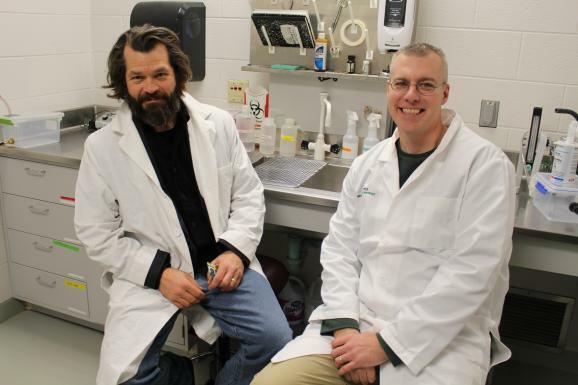 A chance discovery of unexpected behavioral changes in genetically modified mice prompted two Northern Michigan University researchers to embark on an interdisciplinary project. If their collaboration reveals the mice more closely replicate mental illness in humans than existing animal models, it could lead to increased understanding of human psychiatric disorders such as schizophrenia and more effective drug treatments. Erich Ottem of Biology and Adam Prus of Psychological Science received a Northern PRIME grant to support their research. Ottem has been using transgenic mice as a model for ALS in his lab. The animals are bred so that their skeletal muscle fibers are missing a protein-coding gene titled Brain-Derived Neurotrophic Factor (BDNF). This results in a loss of neuromuscular functioning similar to those suffering from ALS. But continuing studies with the mice exposed a number of behavioral abnormalities not previously reported or expected. As a complement to Ottem’s cellular research, Prus will conduct experiments in his lab to better illuminate behavioral differences in the mice. Prus has previously used mice genetically modified in a different way to study novel drug treatments for schizophrenia. Former graduate student Ryan Brandt explored the sensory processing through his thesis research. Ottem and Prus are committed to involving undergraduate students in their research and this joint project is no exception. Prus said the potential discovery of a novel model for neuropsychiatric disorders would provide highly convincing preliminary findings needed to secure more substantial grants from the National Institutes of Health to fund additional research. Pictured in a room with transgenic mice are undergraduate researchers (from left) Cecilia Ruiz, Lea Esterline, Casey Kimber and Joshua Prete.